These days, one of the most common repair jobs in a professional repair shop is going to be carburetor or fuel related. With Ethanol Blended gasoline being prevalent now in most of the United States, fuel related problems are becoming more and more common. One of the biggest issues we see in our shop is due to fuel lines aging and breaking apart from the inside out. Even a well maintained engine which is not yet experiencing any problem, will very likely have the beginnings of a problem if the fuel lines are more than 2 or 3 years old - The following photo shows the result of a carburetor bowl removed from an otherwise perfectly maintained 3 year old lawnmower engine - We dumped out the little bit of gas that was left in the bottom into a clean white shop towel. Even though the fuel line looked "perfect" from the outside, as can be seen in the photo, the rubber line is beginning to break down and rot out from the inside. This is one of the reasons we recommend replacing fuel lines (and belts) every 2-3 years, even if they look perfect. Most often you'll easily see the effects if you remove a fuel line and look end-on at it , observing the I.D. of the line while you squeeze it flat, you'll see the cracks and rot in the line indicating time for replacement. 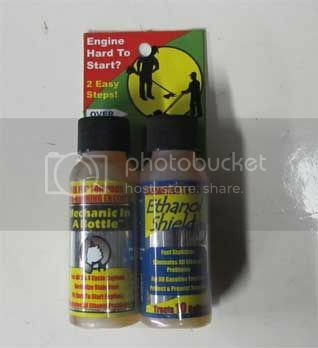 While we have for many years not been a fan of "fix in a bottle" solutions (Radiator Stop Leak, Motor Flush, and the like) , since we became a dealer for B3C Solutions' Ethanol Shield and Mechanic in a Bottle treatments, we've changed our tune a little bit. Ethanol Shield is a superb, second-to-none fuel treatment that we add 1/2 ounce to every 5 gallon can before filling up. Ethanol Blended fuel Treated with Ethanol Shield can be stored and remain stable and usable for as much as 2 years. I've had opportunity to put that to the test myself with a generator stored in a small backyard shed. Ran it once, put it away for almost 2 years, next time we pulled it out, it fired right up on 2-year old treated gas. 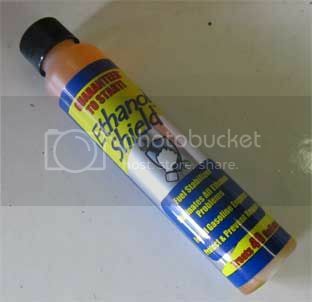 Ethanol Shield also contains additives that help to protect rubber and nylon parts (Fuel Lines!) It's co-worker, Mechanic in a Bottle is a superb cleanup solution, just about every machine that comes through the shop will get a "maintenance" dose of MIB treatment in the tank, and we have had rave reviews from several customers that "gave it a shot" and had amazing results. In a Nutshell, Ethanol blends can cause a lot of problems - and to maintain your machine these days does require quite a bit more than oil change and air filter. Even if you have a fuel filter in the system, it won't help when the fuel line *after* the filter starts to break apart. Fuel lines should ideally be replaced every couple of years, even if they look fine. Using a good fuel stabilizer can help extend that to maybe 3 to 5 years. There are many other excellent stabilizers on the market as well - if you buy fuel, you should *always* use your choice of stabilizer - more popular brands are Star-Tron and Sta-Bil, as well as Fuel Medics. Always follow instructions on the bottle and dose your fuel *only* as much as required - Do not let anyone try to convince you that "More is Better" or try to take a guess at how many ounces (Most bottles should have markings) - Too much stabilizer in your gas can be every bit as bad as none at all. One of the biggest problems with modern ethanol blends is that it quickly absorbs water. Once it absorbs enough, it experiences what is called "Phase Separation", and the water laden ethanol drops out of the gasoline mixture, so your engine ends up running on a mix of alcohol and water (if it runs at all!) 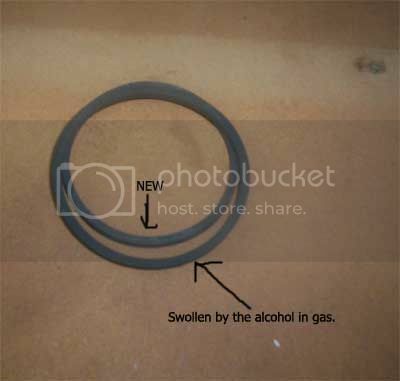 That alcohol and water mixture is *highly* corrosive to carburetors and eats fuel lines, causes rubber and viton parts to swell (See next photo), and wreaks havoc in your fuel system. Then, of course, there is the fact that even if you drain the water/alcohol mixture, the gas that is left is still no good. - You'll have removed as much as 10 to 15% of the fuel's octane rating along with it.. So, what was once your typical 87 octane fuel may suddenly only be 82 or 84 octane, and such a low octane rating results in fuel that burns too fast, ignites very quickly, causes engine overheating, pre-ignition/detonation, backfiring, burned and damaged valves, and more. 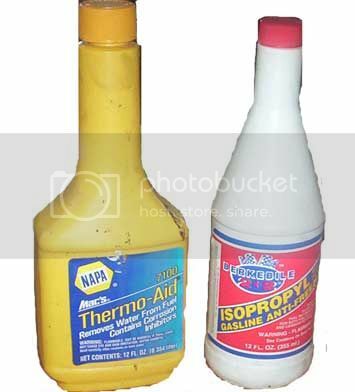 As just explained - Alcohol Plus Water creates a corrosive acid that quickly eats aluminum carburetor bodies. It won't fix anything in your lawnmower, snowblower or other small engine equipment, it won't fix fuel problems, and indeed, will make matters worse. Buy Clean fresh Fuel, and only buy as much as you may use in 30 days' time *OR* Buy yourself a bottle of a good fuel stabilizer, and add a correct dose to your gas can *before* filling it up. Check Fuel lines every chance you get - especially when replacing fuel filter - Squeeze line flat and look at the inside of the line for cracking, which means it is time to replace! - Best is to replace fuel lines every 2-3 years. 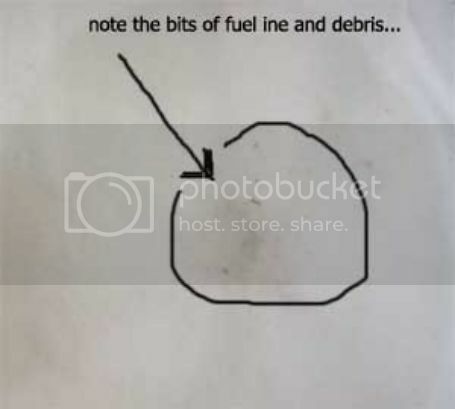 When using Fuel Stabilizer, always dose according to instructions on the bottle - "Too Much" is usually just as bad as "None at All"
NEVER use "automotive" solutions to "fix" problems in your small engines - Things like Drygas, Isopropyl, Starting Fluid "Ether", "Mystery Oil" and similar fixes that work just fine in cars,trucks, and diesels, will almost always kill or severely harm your small engine. And, finally. Not all fuel stabilizers are created equal! read the label and make sure they are designed to work with Ethanol Blends - Those stabilizers also work to "envelope" the ethanol molecules and prevent them from absorbing water in the first place. Not all fuel stabilizers have that sort of blending - and there are still "very old" stocks of stuff like Sta-Bil or SeaFoam, etc. which may have been manufactured on old formulas developed before Ethanol Blends became so prevalent. - Read the labels before you buy it. Contents are copyrighted works, copyrights held by article authors.